On a good night, Rigoberto “Rigo” Alvarado will shuck somewhere around 500 oysters. Plying his trade behind a curved counter that looks out onto Connie and Ted’s shoreline-chic dining room, the 27-year-old chef—de facto shuck master at Michael Cimarusti’s West Hollywood seafood shack—cracks open each craggly bivalve with the same swift, fluid motion. He jams the point of his blunt-tipped knife into the oyster’s hinge, twisting the handle like a key until there’s a soft pop. The blade wiggles forward, slicing the abductor muscle that fastens the oyster to its top shell (the lid), then swoops backwards, sliding beneath the meat to sever the muscle attached to the bottom shell (the cup), taking care not to spill too much of the precious liquor trapped inside. Any errant bits of shell are flicked away with a thumb, the lid is swept into a trash chute, and the newly pristine oyster is neatly positioned onto an icy metal tray. Four hundred and ninety-nine to go. As with any task that requires the sudden and very specific application of force, the shucking of an oyster is a remarkably easy thing to screw up. Maybe you mangle the delicate flesh. Maybe you splinter the shell into near-invisible flecks that end up caught in someone’s throat. Maybe you slip and stab your hand, which even experienced shuckers, ones that have done the task for years, are occasionally prone to doing, resulting in damaged nerves and gnarly scars (Rigo has a few on his left hand). Rigo’s older brother, Jorge, who worked as kitchen manager at Cimarusti’s Michelin-starred Providence, helped him get on as a dishwasher, his first gig in a professional kitchen. After a couple months of hosing down dirty plates, Rigo was eager to start cooking. “I was sick of coming home dripping wet and smelling like suds,” he says. Soon he was bumped up to the role of prep cook. When Connie and Ted’s opened in 2013, Rigo got the call from Cimarusti and Providence co-owner Donato Po. “They thought I would be perfect for the raw bar, I think because I was pretty talkative,” he recalls with a smirk. But there was one problem: he’d never shucked an oyster before. 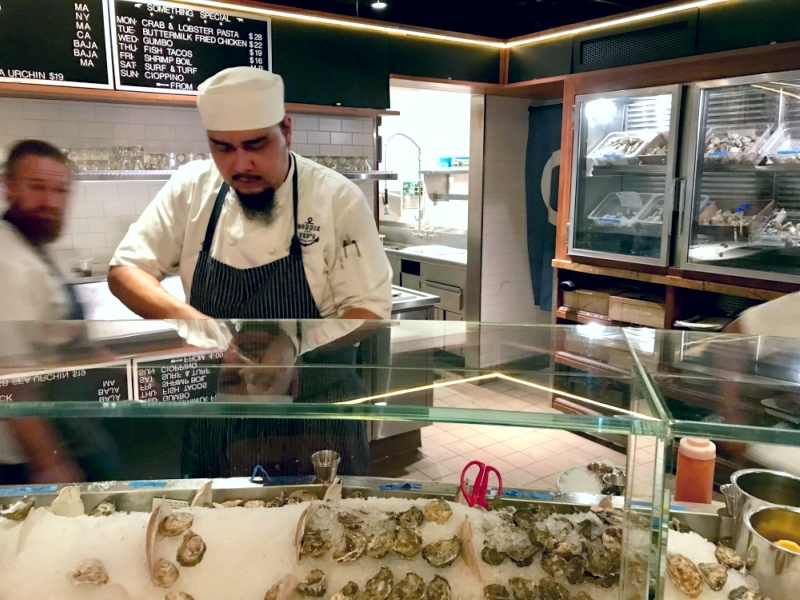 Rigo didn’t care much for oysters growing up, but when he started as a shucker, he remembers the one that set off a light bulb above his head. It was a Sweet Petite, a variety from Massachusetts, whose flavor is true to its name: briny and firm, but with a creamy, lingering sweetness. One slurp and he was hooked. On a black-and-white letterboard behind the raw bar, Connie and Ted’s lists the oysters available that day—usually between 18 and 24 varieties, chosen by executive chef Sam Baxter. Each is subtly distinct in size, shape, texture, and flavor: Cupid’s Choice from Nova Scotia, Fisher’s Island from Long Island, Nautilus from Baja California, Raspberry Points from Prince Edward Island, California Rocks from Humboldt Bay. Sometimes they’ll land a coveted box of wild Belon oysters from Maine, or True Kumamotos from Puget Sound. Connie and Ted’s, 8171 Santa Monica Blvd, West Hollywood.